Around The World Through Holidays: Cross Curricular Readers Theatre includes scripts for twelve plays adaptable for any of the reading or performance methods of Readers Theatre presentation. 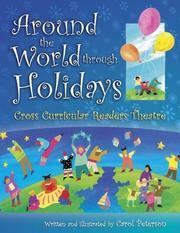 Each play introduces students to a specific world culture by looking at holidays celebrated in that culture. The structure of the book introduces holidays chronologically throughout a calendar year—one play per month. The focus is on literacy and social studies, so the book is not tied to the traditional nine-month school calendar. Any play can be read when the student is studying its culture, rather than during the month in which the holiday is celebrated. In addition to social studies and literacy activities, science and math activities are also included. Suggestions for creating a classroom party to celebrate each holiday and helpful appendices are included as well. Grade level 4-6.